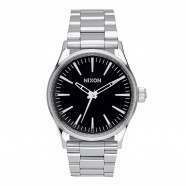 Nixon Watches - Nixon The Cannon Watch - Black :: Men > Watches. Case: Custom 100 meter stainless steel with hardened mineral crystal.\n raised bezel. and triple gasket crown. 48 x 39.50 mBand: Custom stainless steel with locking deployment clasp. 23mm wideMovement: 3 hand Japanese quartzSuited for: Fashion. style and watersportsFunctions: 100m waterproof Size: one size.